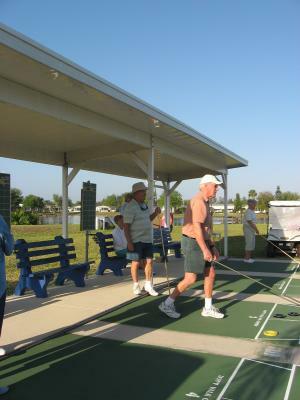 Lakewood Village Homeowners Association offers shuffleboard competition to the residents. Season competition starts the first Monday in November with the season ending the third week of March. During the season teams play each morning Monday through Thursday. After the season ends a shuffleboard tournament is held. It is a two day affair which through the process of elimination four players vie for first, second, third and fourth places. A banquet follows the tournament. Great fun is had by all. Come and join the fun!